Laser Tag at The Stadium in Westlake Village! 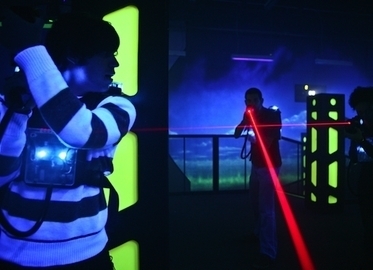 Get 2 Awesome Games of Laser Tag For Just $10 (Value $20). May Purchase up to 6 Certificates Per Person. Rated 4.5 Stars on Yelp! Just in Time for Spring Break! Inside scoop: Rob says this place is "awesome"
Me: So, are they going to run a Conejo Deal? Rob: Of course! Conejo Deals members can purchase up to six certificates, each valid for two games, for just $10…a savings of 50%. To “tag” the deal, just click the gold buy now button and purchase a certificate for each of the laser tag lovers in your family! And it's a great spring and summer break activity!